The almost eternal search for that infernal skirt | Where to next? We’re not big gift buyers when we go on our overland trips. We don’t even buy much for ourselves. It’s really a matter of logistics. You may have plenty of room in your locker on an overland truck, but there’s always that problem of wedging your purchases into a backpack to get them home. Luckily our daughters are used to getting tiny, lightweight presents—exotic necklaces and earrings, handmade Christmas decorations, aprons, fridge magnets and more earrings (including lots of really deluxe ones). So earlier this year, when we were heading out on our second South American overland in less than a year, I realised that I’d run out of ideas. I decided to throw out at least one possibility. Libby, who works in the world of art and museums, is especially interested in wet specimens (you know, icky stuff floating in jars) and textiles. Textiles had to be the go. I remembered the colourful skirts we saw on women throughout Peru, as well as the ones we saw being worn on an island in Lake Titicaca. 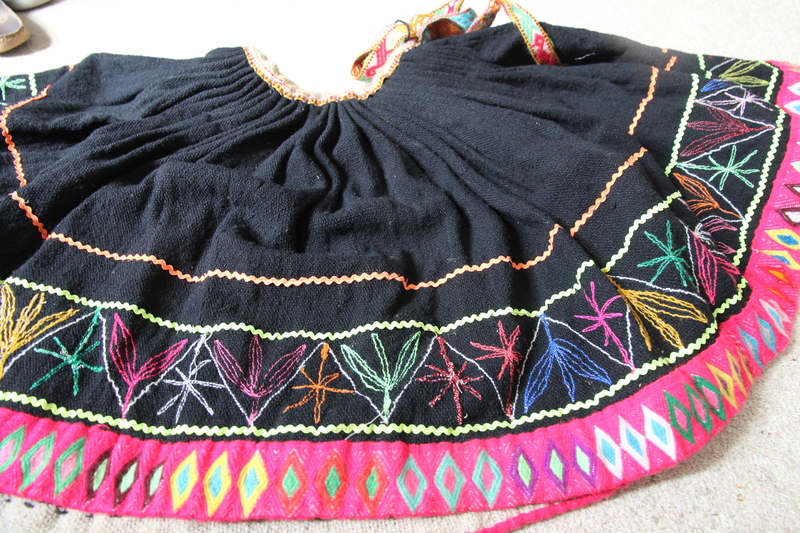 Lib, hon, do you want an embroidered skirt from Peru? Oh wow, did her eyes light up. As soon as we arrived in South America, Poor John joined the effort by constantly reminding me to look for a skirt. In spite of this conscientious nagging, I didn’t even think about skirts for the six-plus weeks we were in Brazil. I was after a Peruvian skirt and I’d have a couple of week to look there. I began the search as soon as we crossed the border. I traipsed through markets, using scribbled sketches and hand signs to try to explain what I wanted. 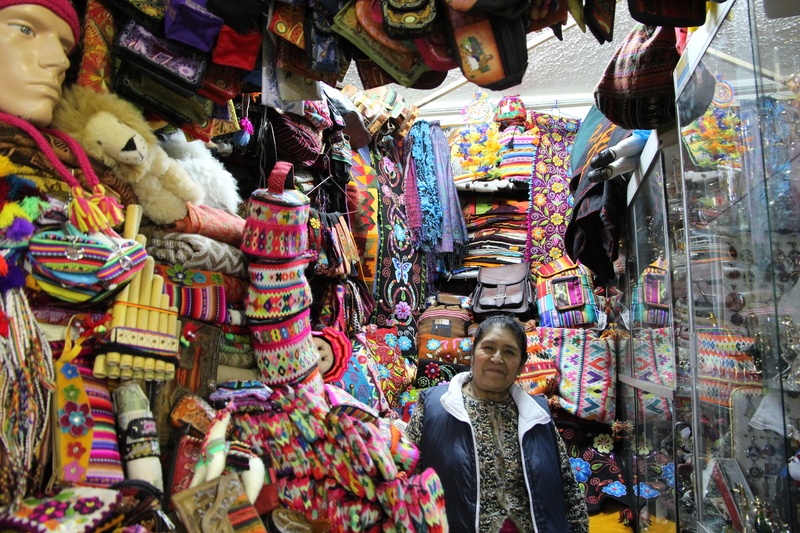 We visited the huge market in Pisac. 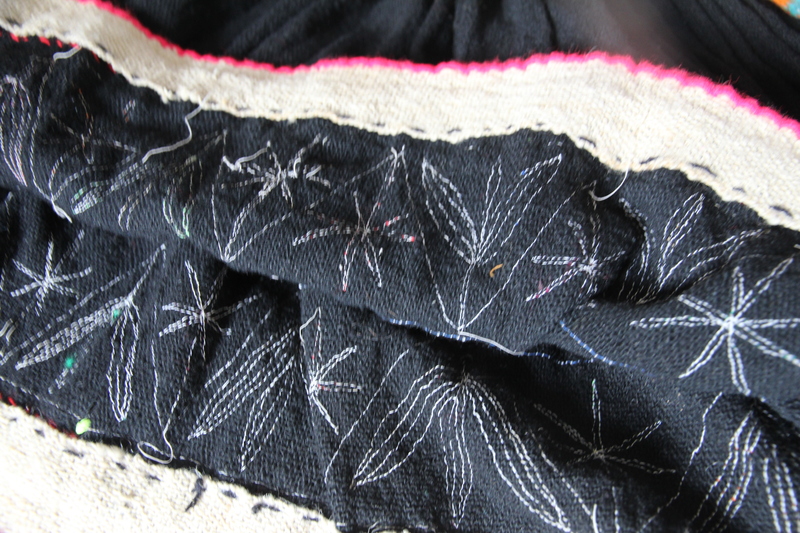 I asked our guide’s sister, who runs a stall there, where I could find an embroidered skirt. She rolled her eyes and shrugged. And then it dawned on me. 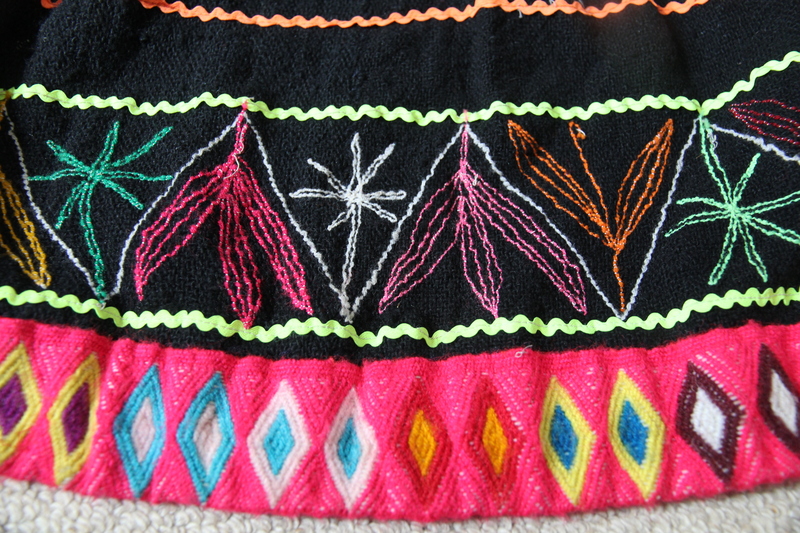 The women in Lake Titicaca had said they decorated their own skirts. And these masterpieces are developed over their lifetimes. Hmm, now what? I hadn’t even seen a plain skirt that needed decorating. 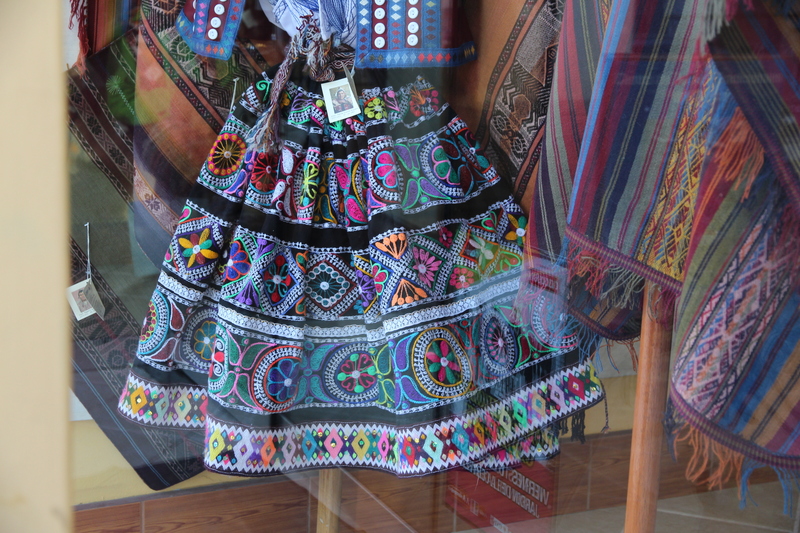 I started making the rounds of all the shops in Cusco and finally found a magnificent skirt in an elegant shop that specialises in works by local artisans. We’d shopped there on our first visit, buying the girls lovely, but small textile pieces. Poor John saw the skirt first, on display in the window. I saw the price tag—US$400. Now I have to admit that this skirt was worth every cent. The design was elaborate and the work was exquisite. Not a stitch out of place, beautiful colours, a truly breathtaking item. But Libby would have shot me if I’d bought it. I knew she would prefer a rustic skirt that would give her some insight into basic Peruvian textiles and their design and construction. I asked the saleswoman where I might buy such a skirt. She confirmed that most women make their own, although admitted that she—as a working woman—had bought hers in her village. So I thanked her and took a picture of the skirt. We were told about a large handicraft marketplace, so decided to walk down there and see what we could find. Mostly plain and poorly made skirts were hanging outside the first couple of stalls. Okay, making headway. At least ready-made skirts existed. We cruised up and down the acres of aisles and stalls, all selling much the same stuff. We finally made it to the very back of this warehouse-like structure, where there was a small café. The waitress invited us over in English. No, we didn’t want anything to eat or drink right now, but is there anywhere we could find a skirt? She pointed across the aisle from us and said, I think that woman has skirts. She led us over, explained the quest and the next I knew we were being shown a fabulous skirt, just exactly what I was looking for. It was wool, huge and heavy. The workmanship was painstaking, but simple. 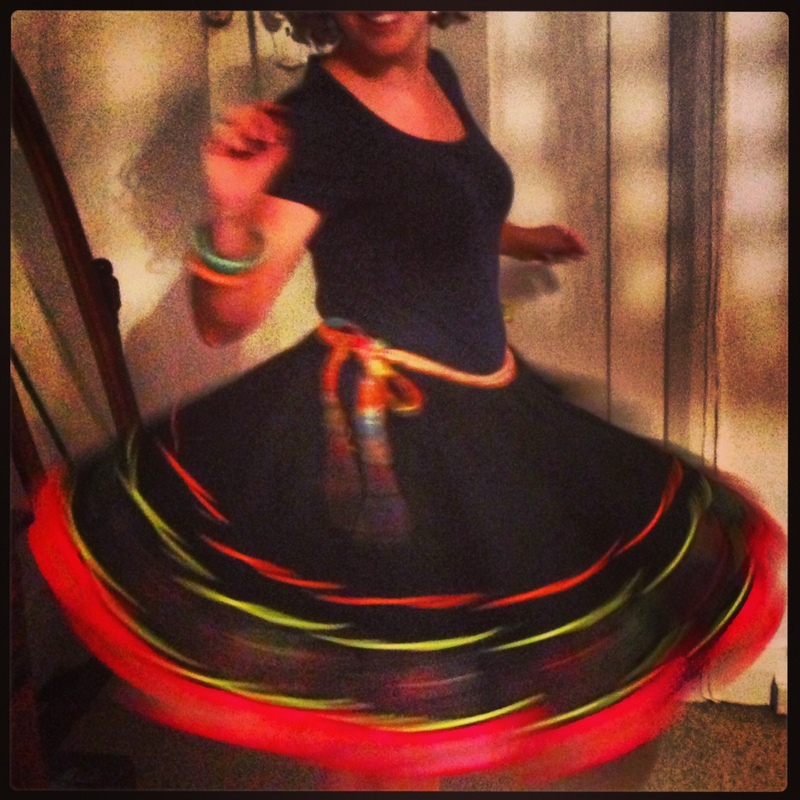 The skirt weighs almost 4 kilos and the waist is large enough to fit the circus fat lady. I told the saleswoman that Libby was quite small, but she showed me how the skirt could be one-size-fits-all. Nothing like a huge built-in belt. So after some cursory haggling, I bought that skirt. And it’s truly perfect. As soon as I presented it to Libby back in Australia, her museum voice asked if I’d declared it in customs. Well no, I said, it’s only wool. Only wool! Mum, she said, wool is like lollies to moths and other insects. And she promptly stuffed it in a couple of plastic bags and crammed it into her freezer for a couple of weeks. 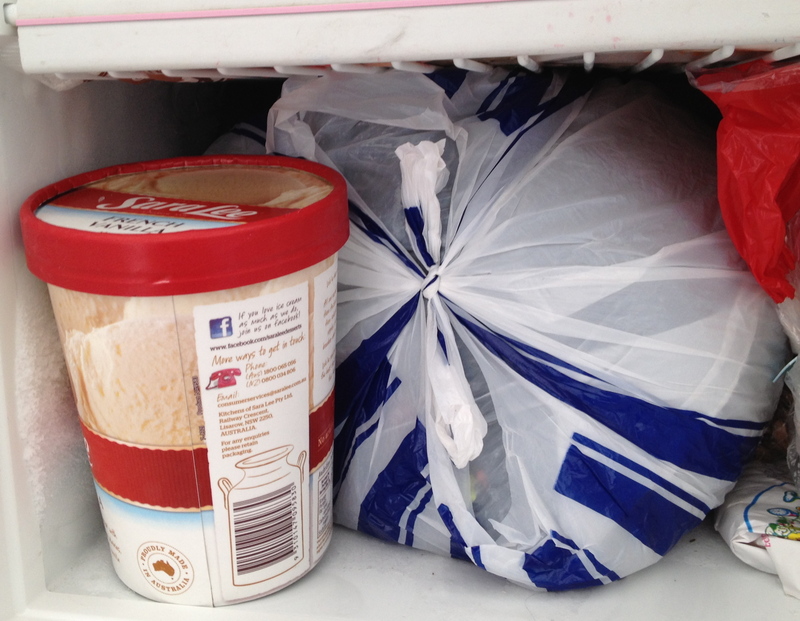 So I had to wait until it came out of the freezer so I could share this story. P.S. Petra got a well-thought-out gift too—a cookbook on ceviche. It explains the history of this classic South American dish and is loaded with recipes. It’s written in both English and Spanish, which should come in handy for someone who is planning to teach languages to high school students. I promise to share the page-32 recipe from that book on my cooking blog. Thanks weggieboy. I must say, I was pretty pleased with myself. Love, love, LOVE the skirt! Libby is a girl after my own heart. I drooled over the photo of the stall where you found the skirt. 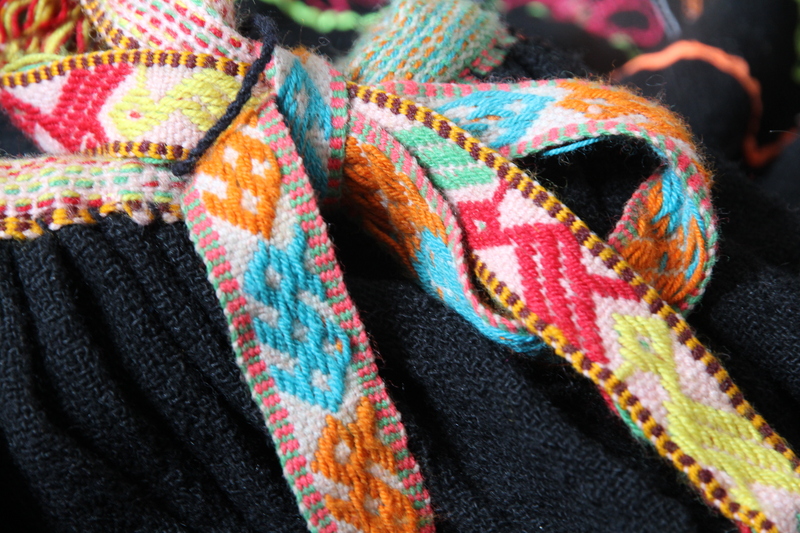 Peruvian embroidery is exquisite. Lucky Libby! Stay tuned Carol, because I’m going to do a post on that whole market. Colour overload. Lucky Libby indeed! Fabulous skirt and an equally fabulous story! Love it. Thanks Sharon. I wonder when Libby will have the chance to wear it out in public? Thanks Rhonda. It really was the perfect choice. Oooooh I LOVE this story – and a suitably exotic and enchanting image of Miss Libby! Thanks weezaj. I love that pic too. Peggy, those markets look fantastic and I’m not really a markets person so that’s saying a lot. The skirt is gorgeous but four kilos seems like a very heavy skirt; especially seeing as Libby’s such a small young thing. I’m amazed that she managed to get that much wool to whirl. It’s a great photo. It’s a very heavy skirt. The wool has quite a thick and coarse weave, and that border at the hem must have at least a kilo of embroidery thread by itself. It was such a wonderful find. G’day and GREAT story today Peggy, true! Perfect pressie and am sure you and Poor John have mastered the art of haggling worldwide too! Yes indeed, a unique skirt. I admit I didn’t haggle hard for this. I was so darned pleased to find it, that I wanted every aspect to be positive for buyer and seller. I later learned that the price I paid was probably low for what it was. A super find and an amazing gift! Thanks Lesley, I was so tickled to find it. Stunning. Remarkable how they can make them by hand. They’re beautiful in the spinning. So much handwork and so beautifully done. Happy Birthday Libby—we recommend the dessert | Where to next?